Wired or wireless, supporting sources analog and digital, these moderately priced, self-powered speakers deliver plenty of value. Dare to be different. Serve a multiplicity of masters. 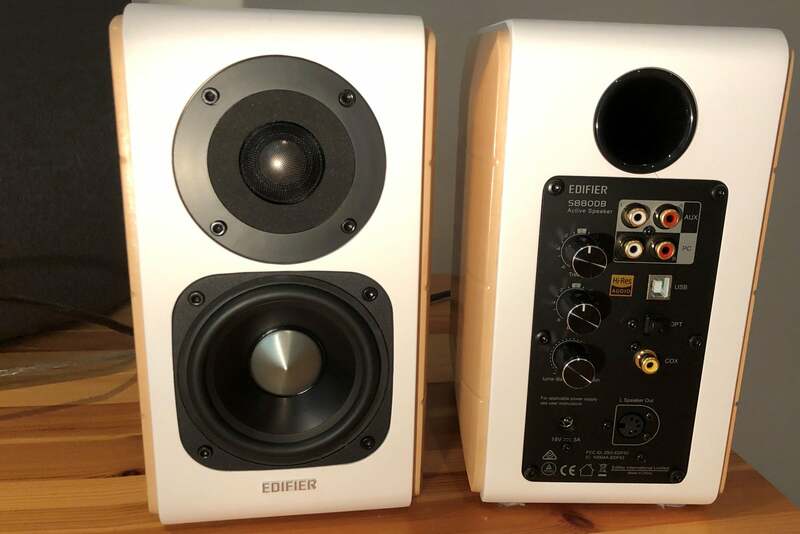 That’s a game plan Edifier is successfully executing with its compact, powerful, and affordably priced S880DB. These self-powered bookshelf speakers aim to please both casual listeners and sound snobs alike. 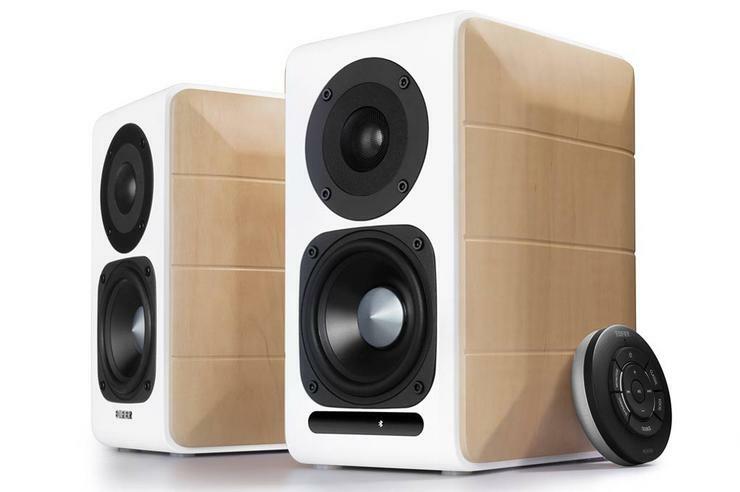 The S880DB are this 20-plus-year-old Asian audio brand’s first Hi-Res Audio certified speakers. As such, they’re designed to handle the better-than-CD-quality tracks offered by services such as HDTracks, OnkyoMusic, and the coming-soon-to-North-America Qobuz—each of which offers downloadable tracks encoded in FLAC with 24-bit resolution at sampling rates as high as 192kHz. These speakers also deliver satisfying sonic experiences with CDs, lower-resolution FLAC files, MP3s, and the like. Wrapped in white and natural wood cabinetry, the compact (5 inches wide x 6.5 inches deep) S880DB can accommodate three types of Hi-Res Audio-compatible sources: Optical and coaxial digital audio, and USB Type B for pairing with a Mac or PC. Two sets of line-level stereo RCA inputs inputs (labeled AUX and PC) offer links to analog sources. Edifier includes cables for making just about any type of connection you might need. Don’t like wires? There’s a Bluetooth 4.1 radio onboard, although that connectivity method won’t allow you to tap Hi-Res Audio tracks. There’s no way, however, to get around the 10-foot DIN cable that links the passive left channel to the amplifier in the right. The Hi-Res Audio-certified Edifier S880DB offer a full complement of wired analog and digital inputs, plus Bluetooth 4.1 for wireless streaming. Each of these inputs is located on the back of the right-hand speaker enclosure, which also houses the amplifiers that deliver 12 watts RMS to each of the 0.75-inch titanium-laminate tweeters, and 32 watts RMS to each of the 3.7-inch woofers. You’ll find large dials for volume control and for adjusting the bass and treble levels on the back of this cabinet, which entails a less-than-convenient reach around to adjust. Input source selection, meanwhile, is accomplished by pressing and then rotating the volume control. The puck-shaped wireless remote control makes each of those adjustments easier, but it has very limited range. And while icons on the itsy-bitsy display beneath the right-hand woofer light up to report the active input, they’re very difficult to see unless you’re in very close proximity—or you’ve memorized the left-to-right order in which they appear. You can crank these speakers up to fill a medium-sized living room, but they sound just as full bodied at lower volume levels, which means they make very good near-field monitors for computer work. There’s a perception in some quarters that metal-clad drivers produce a harder-edged sound than do speakers made of materials such as wood pulp, silk, Kevlar, or polypropylene. And when I first started listening to the S880DB, I thought to myself “Man, do these things sound bright!” As such, my first inclination was to try toning things down with the bass and treble controls on the back of the active speaker and the four-way EQ options on the remote. Neither set of controls delivered dramatic changes. The “Dynamic” EQ setting on the remote does warm the music a tad. 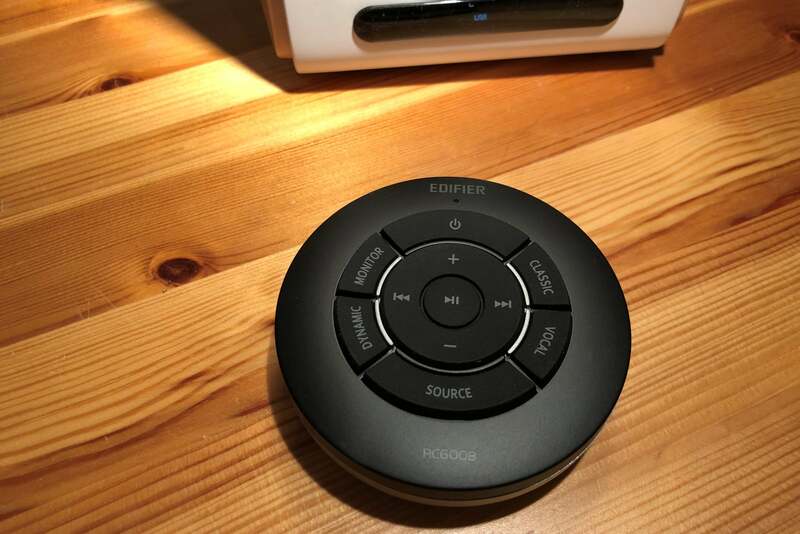 Edifier’s palm-sized infrared remote offers volume and transport control, along with source selection and a couiple of mild EQ presets. A better remedy was to just give the drivers a dozen or so hours of break-in time. I’ve since come around to thinking these armored warriors compare favorably to my larger and almost three-times-as expensive KEF X300 amplified monitors on most musical fronts (excepting big-boom hip hop and EDM). The fine details these speakers expose in more delicate styles of music can be enlightening. Take the throaty vocal drama and Afro-popish, plinkety guitar that Amos Lee brings to “No More Darkness, No More Light,” from his new album My New Moon, or the sizzling slide slinging Brian Jones deploys on “No Expectations,” from the Rolling Stones’ 50th anniversary remaster of the band’s epic Beggars Banquet. The S880DB lent a your-are-there feel to the sweeping violins and brassy horns that carry Gregory Porter’s jazz-pop singing skyward on his new Live at the Royal Albert Hall set. For fun and knowledge, I did some comparing and contrasting of Porter’s “Mona Lisa” as rendered on the lossy Amazon Music and Napster music-streaming services to the lossless streams Qobuz offers (having been granted sneak-peak access to the latter’s European version). The Qobuz streams offered deeper, airier, and more nuanced performances all around. Source material fed to the Edifier’s analog inputs also produced happy results, particularly when I connected the speakers to Meridian Audio’s Explorer2 USB DAC and streamed MQA-encoded tracks from Tidal. With a price tag of just $299.99, the Edifier S880DB don’t cost much more than subscribing to a high-resolution music-streaming service for a year. They’re supremely flexible in terms of accommodating sources, both digital and analog, and they sound equally good as near-field monitors as they do when playing to mid-sized living room. The absence of protective grills would give me pause if I had finger-poking toddlers in the house, and the included wireless remote isn’t one of my favorites, but Edifier delivers value aplenty here.